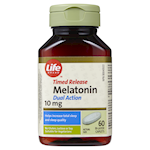 OverviewThis bi-layer 10 mg Melatonin tablet offers dual action to support your sleep. The first layer dissolves quickly providing an immediate dose of melatonin and the second layer is timed released to help ensure a full night’s sleep. 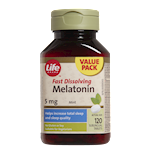 Melatonin is a natural substance secreted by the pineal gland in your brain. It is recognized as a key element in regulating your daily metabolic rates and is synchronized with your biological clock. 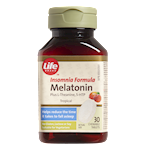 Irregularities in melatonin production can cause sleep problems. When your sleep patterns are disturbed, by travel or shift work for example, supplemental melatonin can help reset your body’s ‘clock’ and improve your length of sleep and sleep quality. Benefits Helps increase the total sleep time (aspect of sleep quality) in people suffering from sleep restriction or altered sleep schedule, e.g. shift-work and jet lag. Helps relieve the daytime fatigue associated with jet lag. Helps to reduce the time it takes to fall asleep (sleep onset latency aspect of sleep quality) in people with delayed sleep phase syndrome. Helps re-set the body's sleep-wake cycle (aspect of the circadian rhythm). Microcrystalline Cellulose, Dibasic Calcium Phosphate Dihydrate, Carbohydrate Gum, Sodium Copper Chlorophyllin, Vegetable Grade Magnesium Stearate, Croscarmellose Sodium. This product contains 1.3 calories and 0.64 mg of sodium per tablet. No gluten, lactose, preservatives, soy, yeast, artificial colours or flavours. Suitable for vegetarians. 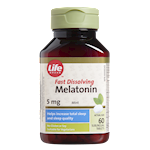 Do not drive or use machinery for 5 hours after taking melatonin At or before bedtime only, 1 caplet daily, or as directed by a health care practitioner. Jet lag: Take while travelling and at destination until adaption to the new daily pattern. For occasional short-term use. All uses except jet lag: For use beyond 4 weeks, consult a health care practitioner. Keep out of reach of children. All uses except jet lag: If symptoms persist continuously for more than 4 weeks, (chronic insomnia), consult a health care practitioner. All uses: Consumption with alcohol, other medications or natural health products with sedative properties is not recommended. Consult a health care practitioner prior to use if you have one of the following conditions: asthma, cardiovascular disease, chronic kidney disease, depression, diabetes or hypoglycemia, hormonal disorder, immune system disease, liver disease, migraine, or seizure disorders. Consult a health care practitioner prior to use if you are taking one of the following medications: anticoagulant, anticonvulsant, blood pressure medications, immunosuppressive medications, sedative, hypnotic or psychotropic medications, or steroids. Do not use if you are pregnant or breastfeeding. Mild gastrointestinal symptoms (nausea, vomiting or cramping) and rare allergic reactions have been known to occur in which case, discontinue use.